When Alma and Amulek returned from Ammonihah to the land of Zarahemla, they “went forth preaching repentance to the people in their temples, and in their sanctuaries, and also in their synagogues, which were built after the manner of the Jews” (Alma 16:13). At that same time, in the lands to the south, synagogues were built especially by the Amlicites “after the order of the Nehors” (Alma 21:4, 16). 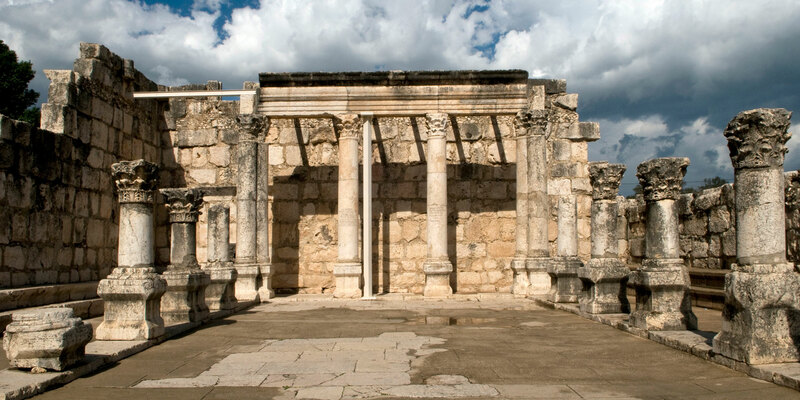 To the north, the apostate Zoramites built their infamous Rameumpton “in the center of their synagogue” in the land of Antionum (Alma 31:13; 32:1–3, 12). As Nephites moved farther north after the wars of the mid-first century, they continued to build synagogues, along with temples and sanctuaries (Helaman 3:9, 14). Its Biblical Hebrew equivalents include “congregation” (edah), and “assembly” (qahal). The synagogue of modern Judaism (the cultural and religious center where Jews gather together to read the Torah and engage in social activities) is the result of centuries of evolution. While its origins are “shrouded in mystery” according to one leading scholar, the synagogue has its roots in the biblical period. “Owing to the paucity of sources, opinions have varied widely as to when, where, and why the synagogue developed.” The structure and function of the modern synagogue appear to have evolved primarily during and after the time of Jesus. That being said, some scholars recognize earlier precedent for the basic idea, at least, of the synagogue (a place of assembly) ranging as far back as the time before the Babylonian captivity (586 BC). Drawing on the body of non-Mormon academic work on this topic, one Latter-day Saint scholar, William J. Adams Jr., observed how “later synagogues closely mirror the architecture of the gate chambers” during this earlier time in Israelite history. “These chambers may well have been the original synagogues.” Indeed, some “biblical passages . . . indicate that the city gate and its vicinity were the hub of a community’s life,” including the marketplace, the general court, the royal court, and places of worship. A number of later passages [in the Book of Mormon] describe visitors preaching and teaching in synagogues. Public discussions of scripture topics in the synagogues were evidently a part of that teaching and preaching. Prayer apparently is also a part of the worship, for in Alma 31:12–14 Alma’s astonished reaction was to the form of the Zoramite prayers, not to the fact that they offered prayers in their synagogues. Accordingly, one need not assume that the places or institutions designated as synagogues in the Book of Mormon were identical to what later evolved into the modern Jewish institution. Like Nephi’s temple built “after the manner of Solomon,” the synagogues in the Book of Mormon were built “after the manner of the Jews.” This can easily be understood as merely meaning that Nephite synagogues functioned as places of Sabbath worship and assembly, and not necessarily that they were built or functioned identically as Old World synagogues. Victor L. Ludlow has suggested that “the custom of open dialogue was a part of synagogue practice in the Book of Mormon,” based on the fact that Alma was allowed to preach in non-Nephite assemblies. This would explain why Alma and Amulek targeted public synagogues as well as private settings in their missionary efforts: they wanted to utilize any forum in which they could point their audience towards the one who would himself preach the gospel of the kingdom in synagogues (Matthew 4:23; Luke 4:16–30). Keith Thompson, “Nephite Insights into Israelite Worship Practices Before the Babylonian Captivity,” Interpreter: A Journal of Mormon Scripture3 (2013): 155–195. For more on the mysterious Amlekites, see Book of Mormon Central, “How were the Amlicites and Amalekites Related? (Alma 2:11),” KnoWhy 109 (May 27, 2016). Readers must be cautious to carefully define and understand how the Book of Mormon uses these words and phrases, and must be cautious not to impose modern culturally inherited definitions back onto Book of Mormon peoples. For example on the ancient definition of the word temple and on the typical functions of ancient temples, see generally Hugh Nibley, “The Meaning of the Temple,” in Temple and Cosmos, The Collected Works of Hugh Nibley: Volume 12 (Salt Lake City and Provo, UT: Deseret Book and FARMS, 1992), 1–41; John M. Lundquist, “What is a Temple? A Preliminary Typology,” in Temples of the Ancient World: Ritual and Symbolism, ed. Donald W. Parry (Salt Lake City and Provo, UT: Deseret Book and FARMS, 1994), 83–117. Theological Dictionary of the New Testament, ed. Gerhard Friedrich (Grand Rapids, MI: Eerdmans, 1971), 7:802–805. Lee Levine, “Synagogue,” in The Oxford Companion to the Bible, ed. Bruce M. Metzger and Michael D. Coogan (New York, NY: Oxford University Press, 1993), 721–724, quote at 722. The scholarly literature on the origins of the ancient synagogue is extensive. See generally “The Origin of the Synagogue,” Proceedings of the American Academy for Jewish Research 1 (1928–1930): 49–59; J. Weingreen, “The Origin of the Synagogue,” Hermathena 98 (1964): 68–84; Lee I. Levine, “The Nature and Origin of the Palestinian Synagogue Reconsidered,” Journal of Biblical Literature 115, no. 3 (1996): 425–448; Steven Fine, Sacred Realm: The Emergence of the Synagogue in the Ancient World (New York, NY: Oxford University Press, 1996); Anders Runesson, The Origins of the Synagogue: A Socio-Historical Study, Coniectanea Biblica New Testament Series 37 (Carolinasalen, Kungshuset, Lundagård: Almqvist & Wiksell International, 2001); Lee I. Levine, The Ancient Synagogue: The First Thousand Years (New Haven, Conn: Yale Universtiy Press, 2005); Anders Runneson, Donald D. Binder, and Birger Olsson, The Ancient Synagogue from its Origins to 200 C.E. (Leiden: Brill, 2008). See the overview provided by A. Keith Thompson, “Nephite Insights into Israelite Worship Practices Before the Babylonian Captivity,” Interpreter: A Journal of Mormon Scripture 3 (2013): 155–195. William J. Adams Jr., “Synagogues in the Book of Mormon,” Journal of Book of Mormon Studies 9, no. 1 (2000): 7. Adams, “Synagogues in the Book of Mormon,” 7. Thompson, “Nephite Insights into Israelite Worship Practices Before the Babylonian Captivity,” 159. Adams, “Synagogues in the Book of Mormon,” 11, scripture citations removed. Ross Anderson, Understanding the Book of Mormon: A Quick Christian Guide to the Mormon Holy Book (Grand Rapids, MI: Zondervan, 2009), 70. See Webster’s 1828 dictionary, online at https://1828.mshaffer.com. See Book of Mormon Central, “Did Ancient Israelites Build Temples Outside of Jerusalem? (2 Nephi 5:16),” KnoWhy 31 (February 11, 2016). See the commentary by Brant A. Gardner, Second Witness: Analytical and Contextual Commentary on the Book of Mormon, 6 vols. (Salt Lake City, UT: Greg Kofford Books, 2007), 4:253–256. Gardner notes that it’s very unlikely that Nephite synagogues remained static. As the Nephites integrated with New World cultures, their architecture, including their sacred architecture, would’ve undoubtedly evolved over time, although the function would’ve remained essentially the same. Victor L. Ludlow, “Synagogue(s),” in Book of Mormon Reference Companion, ed. Dennis L. Largey (Salt Lake City, UT: Deseret Book, 2003), 749.